Thank you for any help, and this should be my last time needing help because im switching to ubuntu, a linux distro. This log has several problems, possible Qoologic, L2M,adaware, trojan. Don't blame MS or IE for your problems, you probably did it to your self. sorry about that, i forgot to do this before i went on vacation. and thanks steamwiz for helping me last time. im running all these scans but it takes forever (what i was fearing when i just posted my log). i hope i can finish this today but well see. yes, someone caused these problems; either me or someone else who used this computer. but i will be using a spyware-free OS from now on, so the other people using this computer can deal with spyware theirselves. microsoft only has this bad spyware problem because its so popular. anyways, ill post the pandasoft and hijack this logs in a day or 2. Please let me know when you find one as I want to invest in it their stock. Not trying to be "smart" here, but the vast majority of problems are created by the user. Granted M$ is full of holes/problems. BUT an up to date OP system, good A/V, firewall and run all things we recommend will go a very long way in protecting you. They have kept me out of trouble for 3 years now. well that took longer than id hope, and it did not go smoothly. sorry i think i may have chopped off part of that last one. then when i tried to run housecall, it would never load, even if i left it there for an hr. then i got some updates, upgraded to sp2 and installed windows defender: that all went well. i ran spybot, it found a bunch of items and it couldnt remove them all so i set to scan on reboot. it still couldnt remove 2 main items with about 20 things under them. O4 - HKLM\..\Run: [epy9J] "C:\WINNT\system32\l3jdfs.exe"
O4 - HKLM\..\Run: [CaAvTray] "C:\Program Files\CA\eTrust Internet Security Suite\eTrust EZ Antivirus\CAVTray.exe"
O4 - HKLM\..\Run: [CAVRID] "C:\Program Files\CA\eTrust Internet Security Suite\eTrust EZ Antivirus\CAVRID.exe"
well thats everything, thanks for your time and effort i appreciate it. uh, i couldnt help but notice that post is no longer there. i followed the directions but i didnt notice anything different, although surfsidekick is gone, still get popups tho. Please download Look2Me-Destroyer.exe to your desktop. Close all windows before continuing. Double-click Look2Me-Destroyer.exe to run it. Put a check next to Run this program as a task. When Look2Me-Destroyer re-opens, click the Scan for L2M button, your desktop icons will disappear, this is normal. Once it's done scanning, click the Remove L2M button. You will receive a Done Scanning message, click OK. When completed, you will receive this message: Done removing infected files! 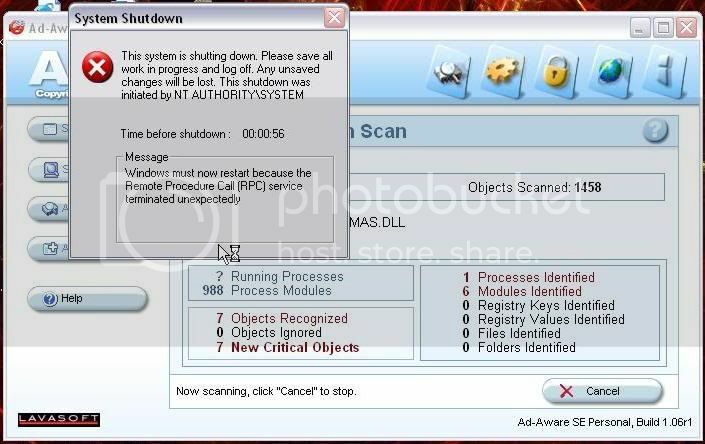 Look2Me-Destroyer will now shutdown your computer, click OK. Your computer will then shutdown. Post the Qoofix results log located in the same folder as the Qoofix. Also want to see Look2Me-Destroyer.txt file along with a new HJT log. Also let us know if the pop ups still appear. O4 - HKLM\..\Run: [iTunesHelper] "C:\Documents and Settings\Owner\Desktop\iTunesHelper.exe"
Well the fixes did what I wanted/expected to do. Re boot the PC in the safe mode by tapping F8 during start up. Select safe mode. The program should launch automatically after installation. If not then double-click the desktop icon. > Before proceeding, deactivate the "Resident Shield" as this may prevent changes to the registry. > To do this, click "Change State" to the right of the Resident Shield option in the main window. > You will clearly see the status change to Inactive if you have done this correctly. > Ewido automatically updates the spyware definitions if you are connected to the net during installation. > As a precaution, click the "Update" icon from the main menu. > Then click the "Start Update" button. > When you receive the "Update successful" prompt, close Ewido. > Open Ewido Anti-Spyware and click the "Scanner" icon from the main menu. > Click "Complete System Scan" to start scanning. > When scanning completes, click "Recommended action" beneath the results window and select Quarantine. > Then click the "Apply all actions" button to quarantine everything detected. > Then click Save report > Save report as and save the Report-Scan.txt to your desktop. Post the results of the Report-Scan.txt in your next post here along with a New HJT log.